Over the years, all of us at Colorado Outfitters have had the opportunity to hunt across the world, chasing new animals, in new territory, and developing new skills that have made us successful. As a result of these experiences, we have also had the opportunity to develop new relationships with others who share our love for the outdoors. For us, the experience and the ability to share it with others is why we believe so strongly in our DIY Drop Camp hunt offerings. There is simply something rewarding about a successful hunt with friends where the success and failures are yours alone. We realize though that at times individuals and small groups may want to find others of similar hunting styles, interests, and yes, budget, to share the expense and experience of a DIY Drop Camp. To help facilitate this, Colorado Outfitters provides this “Shared Trip” space where individuals or small groups can express their interest in teaming up with others to share a DIY Drop Camp with us. Here’s how it works. 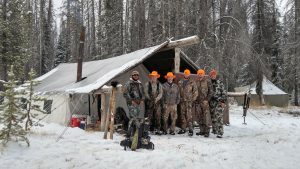 If you or your group is looking to find others who may want to share a DIY Drop Camp trip with Colorado Outfitters, simply post a comment below. In your comment, we suggest you include who is in your group (or if you are an individual), what season and weapon type you prefer, and a way for individuals to get in contact with you. We don’t want to facilitate in-depth discussions here on the website, but instead provide the opportunity for folks to meet and have those conversations via more personal and flexible channels. But before you post, here are a few best practices and disclaimers that you need to know before you consider a shared DIY Drop Camp with new acquaintances. If you form a group, appoint one person to be the primary contact with Colorado Outfitters. This designee is who we will communicate with on logistics, booking, etc. Sharing a camp and a backcountry hunt is an intimate setting. Make sure you take the time to assess what type of individuals you/your group would like to hunt and spend time with. We suggest you write down how you like to hunt, your meal preferences, etc. and match those up to the others you may be considering a shared camp with. Colorado Outfitters will not take responsibility for any personality conflicts or other challenges that arise from a shared DIY Drop Camp. This is your responsibility to resolve and we suggest you take time getting to know other individuals or groups before you decide to share a camp. A DIY Drop Camp has a lot of elements that make it work – collecting firewood, filtering water, organizing gear, cooking, etc. Make sure you decide on who will be in charge of these things or how you will rotate the responsibility among your group. After you have read and considered these things, if you are still interested in sharing a camp, then go ahead and post a comment below. We’ll review the comments prior to them going live. Of course, don’t hesitate to contact us with any other questions. Possible one or two person group looking to share a DIY – Drop camp for 2nd week of 2018 Archery season. Must be Clean, drug free (Drinking ok) and willing to help with camp duties. We plan on hunting from daylight to dark with most camp time at night to eat and sleep. Contact Jon if interested.